Joe Brown is the new Culinary & Food Bank Director / Executive Chef at the Harvest Café & Abundant Harvest Cater at Bethany Baptist Church. Chef Joe has over 39 Years of culinary Experience and 18 years as the owner of Mélange Cafe in Cherry Hill and Haddonfield NJ. 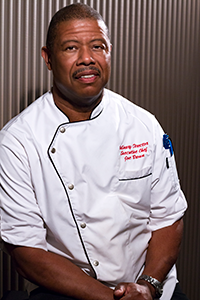 His recipes have been featured in Cooking Light, Culinary Trends, Christian Science Monitor, Ebony, Black Enterprise, Health Quest, American Visions, and regional newspapers and magazines. He has appeared on the National Geographic Channel, Food Network and the Discovery Network. He has also self published a cookbook called Chef Joe Brown's Mélange Café Cook Book. Watching his older siblings gain success in college and the work world inspired him to want his own business. Although his first venture was a Kool-Aid stand, he did not think that business would be a restaurant. However, a summer job after high school graduation changed all that. Joe started working as a dishwasher at a seafood restaurant, and — pardon the pun — he was hooked. “Although I hadn’t initially considered cooking as a career, I really loved it, and I had the natural skills — hand control, stamina, a love of food.” Those skills paid off, and Brown eventually became the first African-American chef at the restaurant. Still, he felt the need for formal training. “Without education, a cook isn’t a chef but a piece of equipment in the kitchen. I wanted more than that." So the ambitious Brown enrolled in The Restaurant School in Philadelphia. While in school, he continued working at the seafood restaurant and took on two part-time jobs, one of which was at Landmark Inn. There he met his mentors: the owner of the Inn who encouraged his dream of owning his own business; and Elijah Dawes, an African-American executive chef who taught him a great deal about professionalism. After graduation, Brown began to seriously plan for his own restaurant. He knew what he wanted: a place that would provide exceptional meals at moderate prices to all ethnic groups. He just was uncertain about the cuisine. Then an “Eureka!” moment happened. Brown and his wife Robin took a trip to New Orleans. Joe immediately fell in love with the melting pot cuisine of the Big Easy, the Southern spirit of hospitality, and the energy that buzzed throughout the city. He opened Mélange Café in 1995. By combining what he loved — sophisticated Creole sauces; rustic Cajun dishes; his Southern heritage — with what he knew — modern Italian cooking; classical techniques; a mastery of seafood — his Louisiana-Italian fusion cuisine was born. Since then Brown has had tremendous success and has received much applause from customers and critics alike. Mélange Cafe has a large, loyal client base, and it buzzes with Big Easy spirit. Joe hopes the restaurant will serve as a training ground for others who are interested in food service careers. “I hope to be able to show others, especially minorities and people who might not want to pursue college, how to be successful in this field,” says Brown. In 1998, Brown was named “Entrepreneur of the Year” by the Upsilon Omega Chapter of the Alpha Kappa Alpha Sorority for his leadership and commitment to community service. Not one to rest on his laurels, Brown plans to further explore the possibilities of Louisiana-Italian fusion cuisine, start a culinary scholarship foundation, and perhaps start a culinary school. After all ... it’s what he was born to do.